Raymond L. Watson is Vice Chairman of The lrvine Company, which has developed the nation's largest master-planned urban environment on its 68,000-acre land resource in central Orange County, California. Ray Watson began his business career as an architect planner. He joined The lrvine Company in 1960 as Manager for Planning and sequentially became Vice President for Planning, Executive Vice President, and President. 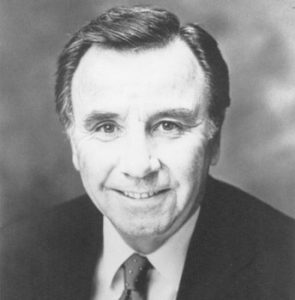 From 1972 to 1977, Ray Watson served as The lrvine Company President. He has been an active member of the Executive Committee and Board of Directors since 1984, and in 1986 became a Vice Chairman. Mr. Watson serves on the Board of Directors and is Chairman of the Executive Committee of Walt Disney Productions; Ray is on the Board of Directors and Executive Committee of pacific Mutual Life Insurance Company, and is on the Board of Directors of Mitchell Energy and Development Company. ​He has won numerous architectural and building awards including the Professional Builder Magazine's Builder of the Year for 1973. Ray Watson is listed in Who's Who of America and was appointed a University of California Regent's Professor for the 1985-86 academic year. Born in Seattle, he grew up in Oakland, California. Ray Watson earned A.B. and M.A. degrees from the University of California School of Architecture at Berkeley. He is a registered architect in the State of California, and a Fellow of the American Institute of Architects (FAIA). Mr. Watson and his wife have four children and seven grandchildren.